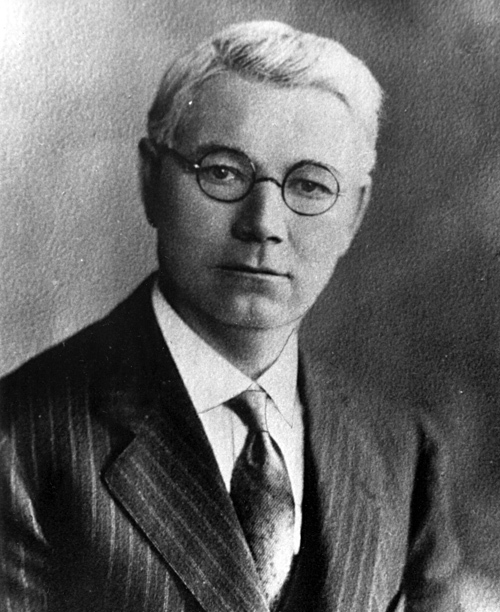 Conrad J. Wagner was born October 4, 1868 in Frank, Russia. In 1898 he married Anna Kissler. The couple came to the United States in 1899 and initially settled in McCook, Nebraska. In 1903, he entered the Chicago Theological Seminary. He graduated in 1906 and was ordained that year. Rev. Wagner held pastorates in Selby parish, South Dakota from 1906 to 1908. He then moved to Walla Walla, Washington where he built and served the Zion church and parsonage during his ministry there (1908-1916). He later accepted a call to Endicott, Washington where he organized the Evangelical Lutheran Church which he served from 1916 to the end of 1922. Rev. 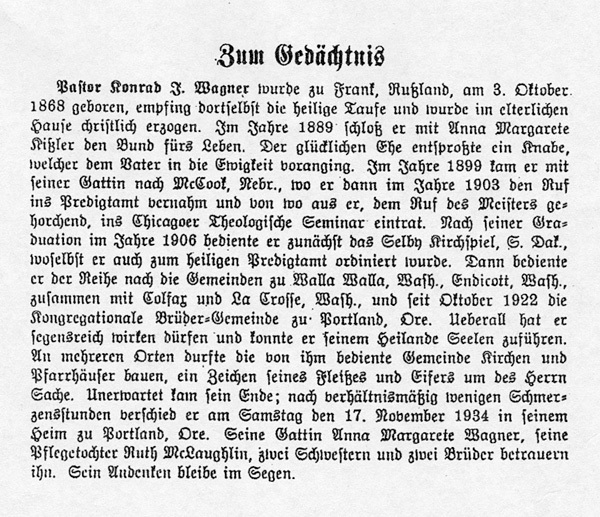 Wagner was called to Portland in September 1922 to become the first ordained minister at the German Evangelical Congregational Brethren Church. Rev. Wagner raised funds to build a new church and parsonage at 238 NE Mason which was completed in 1927. In 1933, Rev. Wagner was embroiled in a dispute that broke our between two factions within the congregation resulting in lawsuits and a loss of members to other churches. The Rev. Conrad J. Wagner died at his home (224 Mason Street in Portland) on November 11, 1934. Funeral services were held at the Brethren Church and he was buried in Rose City Cemetery. Obituary for Rev. Wagner from a German language newspaper. Courtesy of Ruth DeLuca, Walla Walla, Washington. Eisenach, George J. A History of the German Congregational Churches in the United States. Yankton, SD: Pioneer, 1938. 302. Print.